Seasoned trampers like to think they have a monopoly on New Zealand’s wilderness. I’m one of them, so you can understand that what I’m about to say doesn’t come easily. 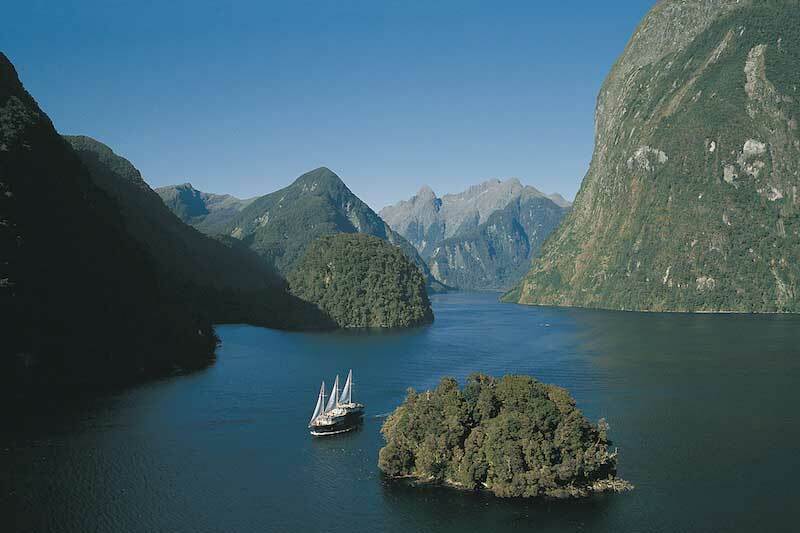 But the fact is, if you haven’t cruised Doubtful Sound, you haven’t experienced New Zealand at its purest. 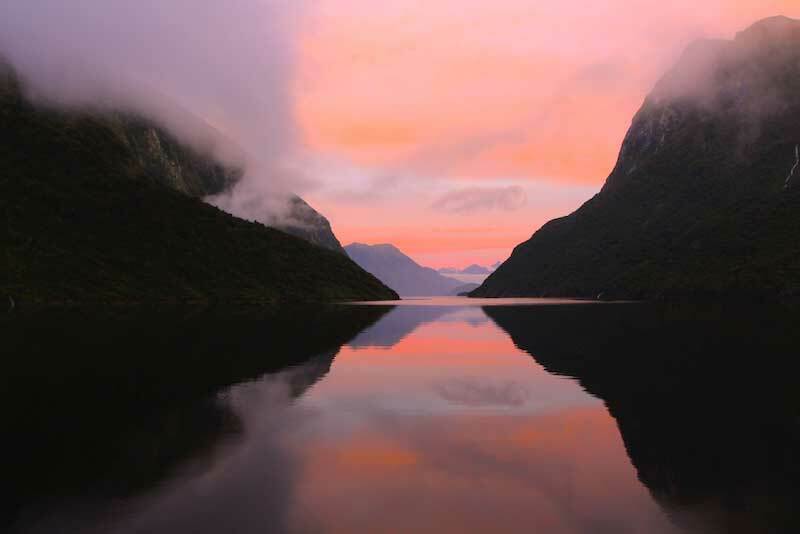 Real Journey’s extraordinary overnight cruise into the deepest, untouched parts of Fiordland confronts you with a raw and pristine majesty that, quite simply, takes your breath away. 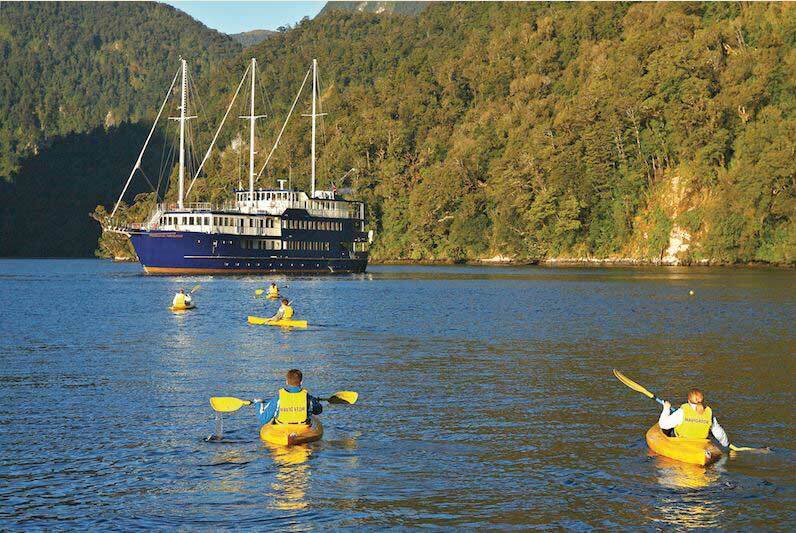 My cruise began at Pearl Harbour on the edge of forest-fringed Lake Manapouri, just a stone’s throw from where the emerald Waiau River skims the dark, moss-covered jetty. The launch that would take me on the first leg of my 23-hour journey was moored to a wide landing. I should have guessed from the unhurried boarding procedure that everything I understood about time was about to disappear. 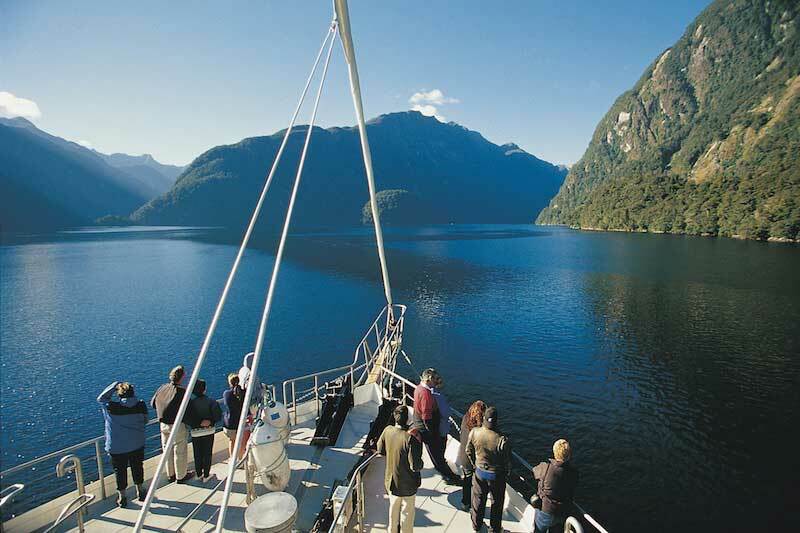 The 50-minute launch ride across the lake is outstanding in itself yet is merely the curtain-raiser for the main act of Doubtful Sound. As we left Pearl Harbour behind, the weathered white granite slopes of Mt Titiroa to the south could have passed for snow, while on either side of the lake, swathes of native forest swept down to meet diminutive, crescent-moon bays and empty beaches of silvered shingle. Tui and bellbird chorused from tiny islands, while above, a brace of paradise shelducks threaded through the sky. The eerie entrance to the underground power station at the western end of Lake Manapouri signals the conclusion of the launch trip. The impact of mankind comes as a surprise for those unfamiliar with the hydro history of this otherwise natural environment. It also explains the existence of the waiting coach and the next stage in the adventure – a 21km journey on an unsealed ‘highway’ completely cut off from any other road in the country. Constructed in the mid 1960s to facilitate the development of the hydroelectricity project, it doesn’t experience a high traffic volume. On a fine day, the view from this magical road’s highest point, Wilmot Pass (671m), offers a clear vista along Doubtful Sound. Just when you find yourself hankering for a photo, your coach comes to a halt – it’s one of the many times you realise Real Journeys anticipates its guests’ every wish. At the tiny settlement of Deep Cove on the western side of the pass, the handsome schooner ‘Fiordland Navigator’ with its three tall masts was waiting for us. Built in 2001 and fitted out with dining room and observation-deck lounge, its private ensuite cabins come with ample window views of the fiord and ensure you’re indulged in quietly sophisticated luxury. Not that you’ll want to spend much time in your cabin. As the Navigator motored away from Deep Cove, within minutes, I was sliding into a New Zealand I never knew existed. Towering walls of granite encased our passage through impossibly deep, black-velvet water, while gravity-defying seedling forests clung to vertical slabs of rock, and myriad waterfalls flung themselves from cliffs to cascade into the fiord below. As if the scenery wasn’t enough, Real Journeys has perfected the art of punctuating the cruise with a host of delightful surprises. In Hall Arm, one of several side-trips taken during the trip, there was an opportunity to explore the shoreline by kayak or motorised tender. At Blanket Bay, history unfolded itself in the form of a quirky fisherman’s ‘hotel’, followed soon after by our push out through the mouth of the fiord past basking seals, roosts of sea birds and the occasional shy penguin. Confronted by the same ocean currents that had convinced 1770s explorer James Cook he’d never be able to sail his ship, The Endeavour, out of the fiord should he enter it, we rode the waves, scanning the horizon for albatross. That evening, a sumptuous meal of New Zealand’s finest produce and wine was served in the Navigator’s dining room. The part played by staff throughout the meal – in fact, throughout the entire journey – was quietly present yet never intrusive. Their gentle humour created an affable camaraderie between everyone on board. This was Kiwi hospitality at its understated best. After dinner, I sat in on the natural history presentation in the observation lounge where many of my fauna and flora questions from the day were knowledgeably answered. Afterwards, over a glass of lager at the bar, I was entertained by a steward who (quite naturally) doubled as the ship’s guitarist. Rocked to sleep in my comfortable bed, I woke to the patter of gentle rain on water. Fiordland receives over seven metres of precipitation a year and I wouldn’t have wanted to miss the accompanying ethereal mists or rush of waterfalls sweeping across broad rock faces. As anyone will tell you, if you haven’t seen Fiordland in the rain, you haven’t seen it in all its finery. Breakfast was every bit as luxurious as the evening meal, and the relaxed chatter of guests who had fast become friends was warm. 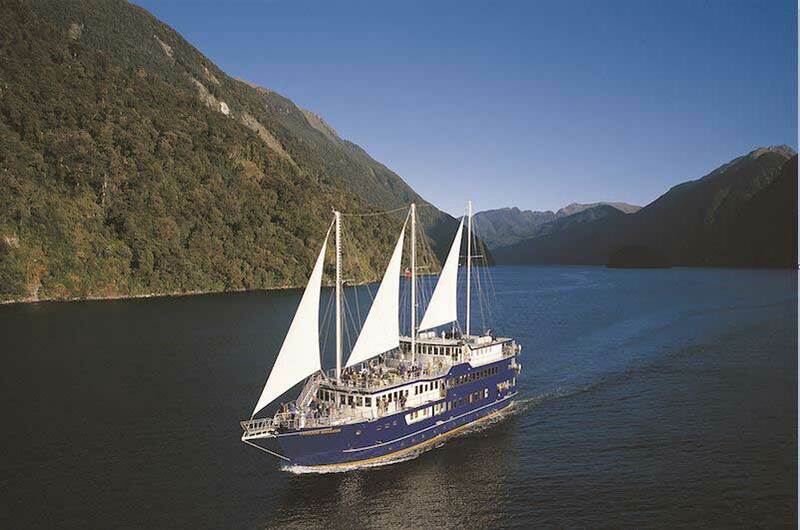 As we lingered over bottomless cups of steaming coffee, the looming sense that our Fiordland experience would soon be over was quickly forgotten when a call was made for us to don our jackets and come on deck. A bottlenose dolphin had been sighted by our eagle-eyed skipper, and we tumbled outside to watch the sleek grey torpedo sprint alongside the vessel and leap beyond its wake. It was a fitting tribute to timeless Fiordland, and shortly before our return to Deep Cove, the Navigator’s sails were raised, the ship’s motors cut, and we were invited to sit amongst the sounds of nature on the foredeck. The early morning chink and chime of forest birds floated across the water. Somewhere, a fish rose from the water and splashed softly back into the depths of the fiord. Water lapped against Navigator’s deep blue hull. Its sails creaked. Here, on this primeval stretch of water, we each gave silent thanks for a sliver of world untouched, and for the journey that had taken us into its heart. Diana Noonan is one of New Zealand’s best-loved and most prolific writers for children. She lives on the remote Catlins Coast of the lower South Island.